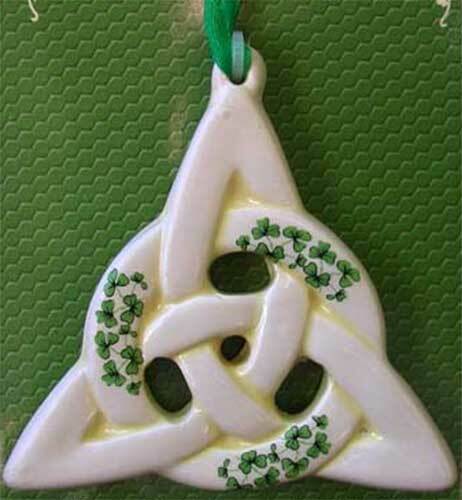 Irish Christmas ornament is a Celtic design that features an interlaced Trinity knot with shamrock accenting. Sorry, this Celtic ornament is sold out for the season. This Irish Christmas ornament is made in Ireland by Liffey Artefacts. This Celtic Christmas ornament features a white porcelain Trinity knot that is interlaced with a shamrock enhanced circle. The Trinity ornament measures 3 1/4" wide x 3 1/4" tall; it is ready to hang on your tree with the included green ribbon. The Irish ornament is received on a header card, complete with Celtic knot and shamrock history cards, complements of The Irish Gift House. Irish Christmas ornament features a bronze plated Trinity knot. Trinity knot is a solid brass ornament that also may be used as a Celtic wall plaque. Celtic stained glass ornament may also be used as a sun catcher in your window.